"Humana commends our participating physicians on their success and we are committed to continue supporting their journey to value-based care with the population health management solutions to help them make this transition and ultimately improve the patient care experience." 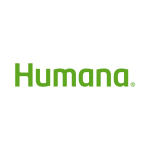 LOUISVILLE, Ky.--(BUSINESS WIRE)--Humana Inc. (NYSE: HUM), today announced that it distributed $77.2 million to physician groups across the United States who participate in Humana’s Provider Quality Rewards Program. Humana has provided reward payments to physicians who have demonstrated quality care outcomes since 2012, reflecting the company’s continued efforts to help transition providers from fee-for-service to value-based reimbursement models. Currently, approximately 59 percent of Humana individual Medicare Advantage members are attributed to primary care physicians who are participating in value-based relationships. Humana’s goal is to continue growing its programs so that 75 percent of individual Medicare Advantage members are attributed to primary care physicians who are participating in value-based relationships by the end of 2017. Humana’s Provider Quality Rewards Program is part of Humana’s Accountable Care Continuum, which is a value-based system focused on promoting evidence-based, high-quality care. The Continuum recognizes physician group preparedness for value-based arrangements by offering several levels of participation through programs including Star Rewards, Model Practice, Medical Home and shared savings/full value programs for value-based care. 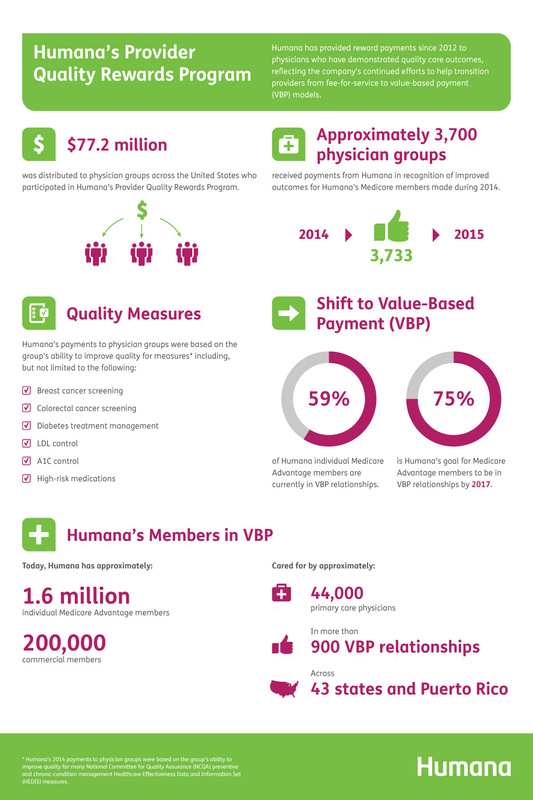 Approximately 3,700 physician groups received payments from Humana in recognition of improved outcomes for Humana’s Medicare members made during 2014. Reward settlement finalization takes place in 2015 for the 2014 Rewards Program to allow time for final claims and submission and supplemental data submission. Today, Humana has approximately 1.6 million individual Medicare Advantage and 200,000 commercial members, cared for by approximately 44,000 primary care physicians in more than 900 value-based payment relationships across 43 states and Puerto Rico.